Raise the federal minimum wage to $9.25 this year and increase it over the next seven years until it reaches $15 an hour in 2024. After 2024, adjust the minimum wage each year to keep pace with growth in the typical worker’swages. Sunset the much-criticized subminimum wages for workers with disabilities employed in sheltered workshops and for workers under age 20. Gradually raising the federal minimum wage to $15 by 2024 would lift pay for 41 million workers—nearly 30 percent of the U.S. workforce. 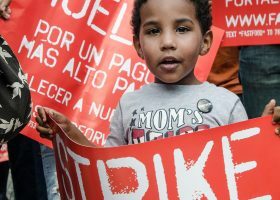 Affected workers who work year round would receive a raise on the order of $3,500 a year—enough to make a tremendous difference in the life of a preschool teacher, bank teller, or fast-food worker who today struggles to get by on around $20,000 a year. Fewer than 10 percent are teenagers, and more than half are prime-age adults between the ages of 25 and 54. More than half (56 percent) are women. Nearly two-thirds work full time. Nearly half (47 percent) have some college experience. The average worker with a spouse or child who would benefit from a $15 minimum wage provides 64 percent of his or her family’s total income. For example, in rural Missouri, a single adult without children will need $32,502 ($15.63 per hour for a full-time worker) by 2024 to cover typical rent, food, transportation, and other basic living costs. In larger metro areas of the South and Southwest—where the majority of the Southern population lives—a single adult without children will need even more than $15 an hour by 2024 to get by: $16.65 in Fort Worth, $16.54 in Phoenix, and $18.40 in Miami. In more expensive regions of the country, a single adult without children will need far more than $15 an hour by 2024 to cover the basics: $25.53 in New York City, $20.47 in Los Angeles, and $24.71 in Washington, D.C.
Nearly one-fourth (23 percent) of workers in manufacturing industries would see their pay increase. About one-fifth (21 percent) of workers in the construction industry would get a raise. All together, more than 12 million workers in construction, manufacturing, education, and health care would see a raise—almost one-third (30 percent) of the workers who would see a raise. 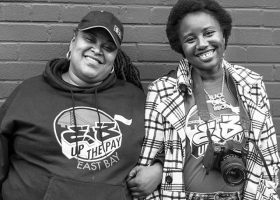 In states that have already approved $15 minimum wages, business organizations representing tens of thousands of small businesses have endorsed a $15 minimum wage. 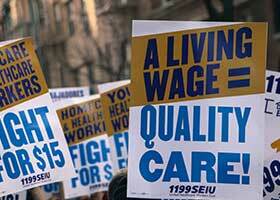 Business groups that have endorsed a $15 minimum wage include Business for a Fair Minimum Wage, the American Sustainable Business Council, the Main Street Alliance, the Patriotic Millionaires, the Greater New York Chamber of Commerce, the Brooklyn Chamber of Commerce, the Restaurant Association of Metropolitan Washington, the Northeast Organic Farming Association—New York Chapter, the Long Island African American Chamber of Commerce, and others. Growing numbers of employers have raised their starting pay scales to $15 or higher. These include insurers and banks such as Allstate, Aetna, Nationwide, USAA, First Green Bank, and Amalgamated Bank; tech leaders such as Facebook; and major health care and nursing home employers in at least six states including the University of Pittsburgh Medical Center, Johns Hopkins Hospital in Baltimore, Minnesota’s Allina Health, and Florida locations of Consulate Health Care. Today’s low-wage workers earn less per hour than their counterparts did 50 years ago. We can afford to pay the lowest-paid worker in America today substantially more than what her counterpart was paid half a century ago. The economy has grown dramatically over the past 50 years, and workers are producing more from each hour of work, with productivity nearly doubling since the late 1960s. If the minimum wage had been raised at the same pace as productivity growth since the late 1960s, it would be nearly $19 an hour today. 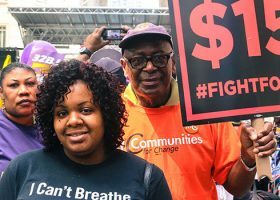 The potential benefits of a $15 minimum wage—$144 billion in higher wages for 41 million U.S workers—far exceed the potential costs. 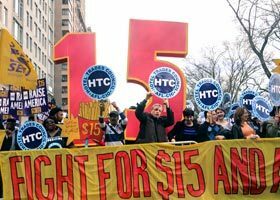 Opponents of a $15 minimum wage are likely to rely on a Congressional Budget Office analysis of the likely impact of President Obama’s proposed $10.10 minimum wage. Serious analysis has called CBO’s assumptions into question. (10) But even CBO’s methodology implies that the benefits of a gradually phased-in $15 minimum wage vastly outweigh its costs. If job growth does slow, some workers who work less can still come out even. There is significant churn in the low-wage labor market; as many as 10 percent of the lowest-wage workers leave or start jobs every month. So some of any decrease in the number of new jobs created will mean that there are workers who will take more time finding a new job, or have to work fewer hours, but who will not see a drop in their annual earnings because of their wage increase. 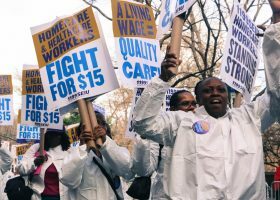 High-quality academic research confirms that modest increases in the minimum wage have not led to detectable job losses. (11) It is time to support a bolder increase.